Feuilles de Manioc: French, feuilles (approximately pronounced "foy") = leaves; manioc = Manihot esculenta or cassava. The cassava plant is grown all over the world's tropics for its edible tubers. The cassava plant is native to the tropics of the Americas and was introduced to Africa in the early 1500s. Africans, particularly in Central Africa, seem to be unique in their consumption of cassava leaves as a légume-feuille (leaf-vegetable or greens). 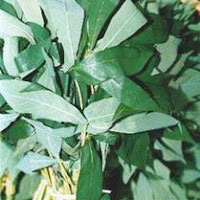 Cassava leaf greens are cooked in many African stews and sauces. Wilt the cassava leaves, a handful at a time, by briefly pressing them on a heated skillet or griddle. Use a mortar and pestle to crush them. (Placing the leaves in a large oven-proof glass bowl and carefully grinding them with the bottom or a sturdy bottle works too.) Grind the onion, if desired, into the leaves. In an enameled pot (if you don't want to use a terra cotta pot over an open fire) bring a few cups of water to a boil. Place the crushed leaves in the pot. Keep the leaves at a low boil for an hour, adding water if needed. Add the fish, baking soda (or salt), chile pepper, or garlic, as desired. Continue to cook until the liquid is reduced to a sauce and the leaves have lost their bright green color. Add the palm oil or moambé sauce and cook for a few more minutes before serving. These dishes are the most basic cassava leaf recipes. They were developed in times when even salt was a rare and expensive item, so sel indigene or "vegetable salt" (salt obtained from bark or leaves) is used (baking soda is a similar-tasting substitute). Traditional cooks also insist on the most traditional cooking method: a clay cooking pot (instead of a metal one) over a wood fire. Clay cooking pots may also be needed to properly prepare foods that are used in a ceremonial or religious context. In some parts of Central Africa, a potful of feuilles de manioc, plus a staple made from manioc tubers might be an entire meal. Cassava plants grow only in the tropics, and their leaves are not traded commercially ouside of African markets. If you have access to cassava plants, pick the newer, smaller leaves. Larger leaves are too tough to cook well as good greens. Outside of Africa, substitute any other greens (collards, kale, etc.) and reduce cooking time.